Recent figures released by The Society of Motor Manufacturers and Traders show the popularity of vans among commercial vehicle drivers is at an all-time high. The report shows that nearly 100,000 vans were registered in the first three months of 2015. A 22% year-on-year increase, the number is the highest since records began in 1987. In the past few months flooding has caused severe problems in Wales, which has caused damages to many residents’ homes and vehicles, as well as local roads. Last year has been one of the wettest years on record for Wales, with five and a half feet of rain falling between January 1st and December 26th 2012. One van driver had first-hand experience of the problems the flooding has caused when his Ford became trapped in a ford whilst attempting to make a delivery. Fleet managers and private buyers have always considered the “What Van” Van of the Year awards as a good guide to determine what vehicle they will get van insurance quotes on when the time comes to update their van or stock. 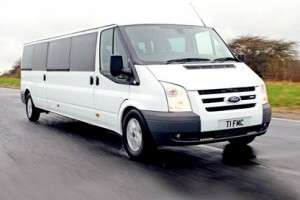 This year British vans did exceptionally well winning 50% of the categories up for grabs. Leading building and maintenance services contractor Mountjoy has replaced old vehicle stock with 132 new Ford vehicles. This means that their entire fleet of 176 vehicles is now 100% Ford. Most of the vans will be used for repair work on over 8,000 residential homes by multi-skilled experts across a range of fields, from plumbing to carpentry and from electrical work to decorating. One of the UK’s most loved (and used) vans celebrated its 45th anniversary this weekend, and there appears to be no stopping it.